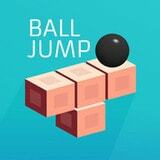 All that is required from the player in Ball Jump is in time to jump. Thereby it is necessary to overcome all obstacles in level and to reach finish. In game you are waited by fascinating tasks in 3 locations.